Get ready to witness some serious luxury, because the home we're about to tour is brimming with contemporary style and sophistication. The brainchild of London's Gregory Phillips Architects, this stunning abode impresses in modern majesty, with understated design features and opulent finishes and furnishings combining to create an expansive, inviting modern palace! 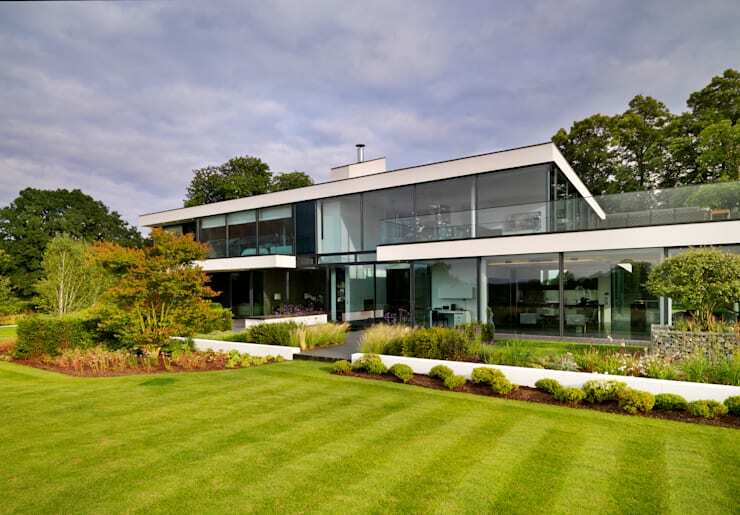 The exterior has been crafted of steel, concrete and large stretches of glass panelling, revealing a home that is beautifully open and filled with light and air. The interior certainly doesn't disappoint, with its spacious living plan evoking a sophisticated yet casual atmosphere, and housing a range of furnishings of the utmost style and quality. The master bedroom showcases a stunning design, with its gorgeous view complemented by the palatial glamour of a marble-trimmed bathroom. An expansive courtyard streams out over the side of the home's upper level, providing another vantage from which to admire its rolling, green surrounds. On the lower floors, adjacent to the living quarters, a state-of-the-art gym area has been included for added luxury, while the ground floor in its entirety has been designed to seamlessly combine with the home's back garden, making the most of the countryside beyond the abode's glass borders. This modern day mansion is stunning in is opulent sophistication, presenting the ideal abode for a budding family to enjoy the simple charm of country living. Take a tour below and tell us what you think! 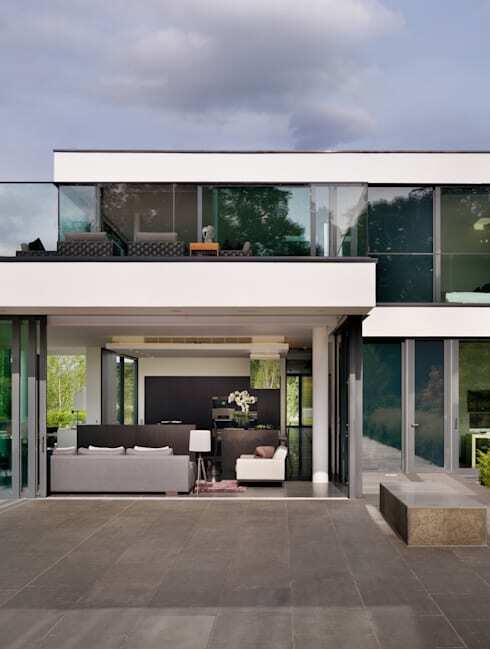 The exterior of the home is streamlined and contemporary, with glass, concrete and steel combining to produce a sleek and sophisticated facade. The home appears open and expansive, with glass panels comprising much of the exterior in order to accommodate a steady influx of natural light and air. Built into the upper level is a spacious courtyard, providing a stunning vantage from which to view the surrounding greenery of the garden and rural locale. This perspective showcases the primary kitchen, dining and living areas within the home, which are nestled amongst a generous stretch of glass panelling, providing a lovely view of the its natural surrounds. The decor is modern and luxurious, with the cool grey of the floor tiles combining beautifully with the deep tones of the thick wooden partitions and the expansive effect of the white walls and ceilings. The furnishings within the space are simple and sophisticated, from the crisp lines of the comfortable couches to the contemporary design of the dining setting, while the kitchen adds a sense of depth, with its dark wood and marble finishes infusing the home with a luxurious atmosphere. This stunning home includes multiple areas for relaxed living, with this space presenting an entirely new atmosphere, blending gold and caramel tones throughout its decor and furnishings. The colour scheme appears warm and inviting, with the soft textures of the rug balancing the sheen of the leather sofas. A low-lying, woooden coffee table adds a casual element to the space, while the crisp white of the twin standing lamps and flourishing orchid present a colour contrast. As with all the spaces in this house, this living room is bordered by large, glass windows, allowing for a steady stream of sunshine in fine weather and a lovely view of the gardens beyond. The master bedroom is comforting and modern, with the soft browns and whites of the colour scheme combining to create an inviting design. The bed appears extremely luxurious, inviting the occupants to rest in cushioned comfort and admire the vibrant greens flowing in through the room's large windows. Furnishings have been kept simple, limited to two bedside tables decorated with contemporary lamps, while in the corner we can see the beginnings of a marble-finished space for bathing, presenting the ultimate in modern luxury in the privacy of this relaxing and stylish room. Rounding the corner and we're embraced by an opulent and luxurious marble-trimmed bathroom, which looks out grandly upon the surrounding countryside. The bathroom is minimalistic and modern, housing only this beautiful bathtub, a streamlined sink unit with chic, black bench top and a large, glass shower unit. This stylish space has been beautifully incorporated as part of the master bedroom, creating the effect of a luxurious, private suite within the home. Aside from the bedroom areas, the upper level of the home also includes an expansive space for outdoor relaxation and entertaining. Decked in dark wood and trimmed by a glass balustrade the space presents the perfect locale in which to unwind, with a stunning view of the home's vibrant, green environs and the pristine blue of its swimming pool filling the scene. The furnishings included are stylish and modern, with their simple design in keeping with those already seen within this sophisticated home, while a colour contrast has been incorporated through the inclusion of coffee and side tables with a glowing, caramel timber finish. 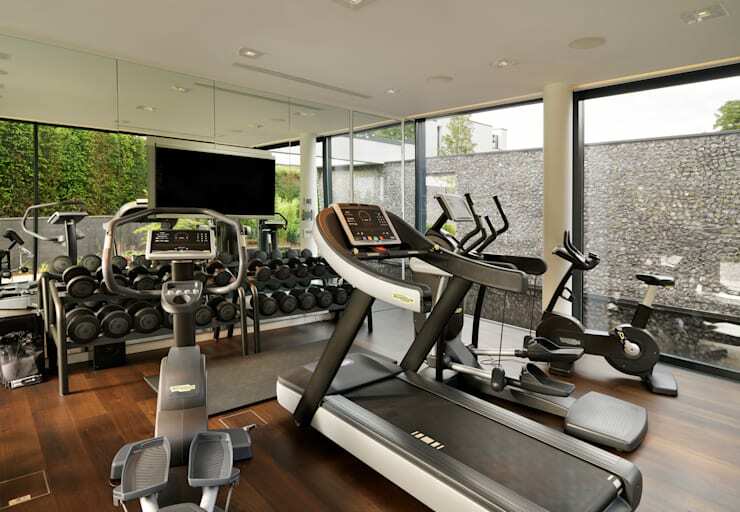 Adding to the luxurious elements within this amazing home is a state-of-the-art gym, with its open and inviting atmosphere primed for a heavy workout. The room is bordered by expansive windows which allow for a view of the exterior of the home, while a grey, stone wall frames the space for privacy. Sliding doors invite air to circulate within, and can transform the gym to blend with the home's back yard in order to accommodate the refreshment of outdoor exercise. This expansive home opens out fully onto the back garden through a generous array of glass doors, beautifully blending the indoor and outdoor living spaces. Smooth, grey tiles line the exterior courtyard, as the living, dining and kitchen spaces seen here flow within. The rear of the home is extremely functional, with this space able to be dressed up with outdoor furniture in fine weather or rest simply as a space for sun-bathing after a dip in the cool waters of the home's swimming pool. After dark the home truly comes alive, with its sleek external lines and the warm tones of the interior colour scheme beautifully illuminated against the night sky. The stylish furnishings of the living spaces sit serenely within, while the soothing green of a water feature surrounded by classic, wooden decking is lit by flowing streams of light. Did you enjoy the rolling green of this home's expansive garden? If so, have a look at these tips to Create your own holistic garden for further inspiration! Would you like to live in this modern-day mansion? Tell us your thoughts below!